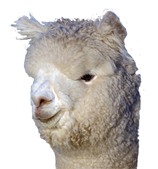 Ambersun Alpacas is based at Mount Compass, 60 kilometres south of Adelaide, the capital city of South Australia. 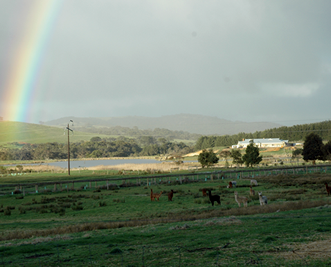 The farm is easy to locate, positioned on the main Adelaide to Victor Harbor Road (A13). As they consider their good fortune, the area adjoins McLaren Vale, one of Australia's best known wine producing areas. The region is also noted for tourism, being located within 20 kilometres of the seaside resort of Victor Harbour, which is blessed by beautiful white sanded beaches during the summer and renowned for whale watching during the colder months. Understandably, this region of the Fleurieu Peninsula is a popular tourist destination. Alongside the alpacas, the Mt Compass farm is also regularly visited by Australian wildlife. Kangaroos and echidnas are often seen lazing around in the relaxed environment. The farm, of 234 acres, is also home to abundant birdlife, including the rare Southern Emu Wren. Many water birds, including swans, spoon bills, ibis and native ducks and water fowl take advantage of the beautiful 4.5 hectare lake on the property. A multitude of species of frogs serenade the evening air to provide for an idyllic setting.